D is For Dollikin was updated July 12 2003, with a few new pictures on the Dollikin Details page. April 25 2003 saw a big update, with two looks added to the Dressing Dollikin page. A new page, Disconcerting Dollikins, details rare and mystifying Dollikin variations. The Triki Miki page was split into two, with the new Triki Miki Togs page hosting the latest glamour shots of Triki outfits. Other pages were also freshened up with new images and links. D is for Dollikin was updated November 8 2002, with images of boxed Action Girls and photos of the African-American Triki Miki. The entire site was reconstructed during September 2002 to fix design glitches. 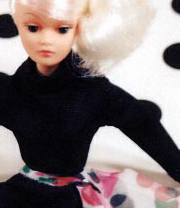 On August 27 2002, I added illustrations to many pages and posted three new photos of Dollikin dolls in mod outfits. In April 2002, the edited and reorganized site was relaunched with new material. This site was first launched in August 2001. Text and most of the photos are © of the author. Any other images posted here are for information purposes only. If you are the author of an image featured here or the owner of a doll or other item pictured here and would like to receive a credit, please e-mail me. New information and pictures are always welcome. None of these items is for sale; do not enquire. All doll and character names are trademarks of their respective owners. Counter courtesy WebCounter.